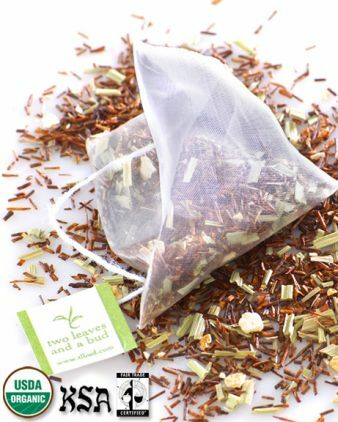 Two leaves’ African Sunset rooibos (red) tea brews up rich and lemony with just a hint of lemongrass tang to craft a sweet and interesting flavor. High in anti-oxidants and trace minerals with zero caffeine, African Sunset and other red teas only grow in South Africa. With a spicy, somewhat astringent herbal flavor, African Sunset makes for a great tea alternative. As alluded to in the above description (from the Two Leaves and a Bud website), this tisane does have a sweet and interesting flavor. Rooibos tends to have a naturally sweet flavor – often to the point of being too sweet for my liking (and I have a sweet tooth!) But it’s not so much that it’s sweet, but it’s the funky aftertaste that comes along with that sweetness. It reminds me of artificial sweetener – not my favorite flavor. But that is not to say that I dislike all rooibos blends – there are some that bring together just the right combination of flavors to offset that funky sweet flavor that I dislike. Like this blend – African Sunset – from Two Leaves and a Bud. The tart lemony flavors successfully cut through some of the sweetness to give the cup a nice balance. I previously reviewed this tea, and I like it just as much now as I did back then. It is light-bodied and fresh-tasting – and a very nice tea to enjoy later in the evening. It is naturally caffeine free so this tea won’t leave me feeling restless at bedtime. When served hot, it is a comforting tea to curl up to and sip leisurely. When served chilled, it is a refreshingly light beverage. It’s a nice tea to have on hand at all times!